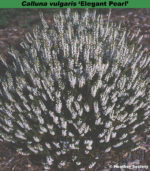 Pale (H3) lavender flowers, IX–XII, with mid-green foliage; upright; height 21–25cm; spread 31–45cm. A good late cultivar. Named after the finder, an American airman, friend of Letts. Crimson (H13) flowers, VIII–X; dark green foliage; less graceful but more compact than 'C. W. Nix'; height 10–15cm; spread 31–45cm. Pale purple (H10) flowers, VIII–IX; light green foliage; new growth is creamy white and red retained into the summer; open upright habit; height 31–45cm; spread 46–60cm. Seedling; found by S. Ketelaar (Nieuwegein, Netherlands) about 1976; introduced by P.G. Zwijnenburg (Boskoop, Netherlands) in 1982. Name alluding to the foliage colour and season. The name is hyphenated. Magenta (H14) flowers, deepening to crimson (H13), VIII–IX; mid-green foliage; broad, erect habit; height 31–45cm; spread 46–60cm. Sport on 'Carmen': found by Kurt Kramer (Edewecht-Süddorf, Germany) in 1982, and introduced by K. Kramer in 1987. 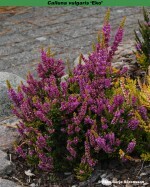 Named after Herr Miessner (1910-1972) wrote the first German book on heathers in 1970 (Der Heidegarten 20: 4-11 (1986)). German orthography is 'Eckart Mießner'. Lilac-pink (H11) flowers, VIII–IX; mid-green foliage. Very floriferous. Named after an aunt of Sqn. Ldr. A. Taylor who found it in her garden at Crowborough, East Sussex, England; height 31–45cm; spread 61–75cm. Flowers purple (H10), single, small; VIII-X(early); foliage in summer green tinged bronze, bronze more pronounced in young growth; individual leaves very small, and congested on stems; shoots very neatly 4-sided; habit upright, bushy; height 22cm; spread 22cm after 4 years not pruned. Selected from mixed seedlings, raised from open-pollinated plants. "No other cultivar has this combination of foliage and flower colour." Eko means echo in England: "once seen one will recall it". ® C.2015.10 registered on 21 September 2015 by Sten-Börje Sörensson, Almvägen 7, 475 51 Hönö, Sweden. White flowers, VIII–IX; mid-green foliage, with striking yellow young shoots in spring; compact, erect habitt; height 26–30cm; spread 31–45cm. Introduced Mrs P. Rodwell (Upminster Lodge Nurseries, Upminster, Essex, England) in 1995. White flowers, VIII–IX; bright green foliage; height 31–45cm; spread 61–75cm. This white-flowered circulated in Netherlands before 1970 under the name 'Elegantissima' which had also been applied to a pink-flowered clone (from Portugal, collected by Walter Ingwersen); re-named by Dutch nurserymen in 1970. Name alluding to the former name ('Elegantissima') and the white flowers. White flowers in long tapering spikes, VIII–IX; bright green foliage; height 31–45cm; spread 46–60cm. (The name was also used at one time for 'Walter Ingwersen'. ❁ Silver-rose flowers, VII–X; dark green foliage; spreading, open habit; height 35cm tall; spread 35cm. A sport on 'Tib' found in 1980s by E. H. Becker (Borstel-Hohenroden, Schleswig-Holstein, Germany) in 1984, and named after his wife. ♤ Bud-flowering; buds white, 5mm long; IX-XII; foliage light green; habit bushy, broad; height 30cm; spread 35cm after 3 years (pruned). Deliberately raised cross by Kurt Kramer, made in 2008 between unnamed seedlings, selected in 2009. ® C.2013:07 registered on 8 December 2013 by K. Kramer, Edewecht-Süddorf, Germany. White flowers, VII–VIII; mid-green foliage; compact broad habit; height 10–15cm; spread 21–25cm. Named after the place where it was found, Elkstone on Morridge Moor, Leek, Staffordshire. Crimson flowers, VII–IX; bright green foliage; broad erect habit; height 26–30cm; spread 31–45cm. Sport on 'Darkness'; raised and introduced by H. van der Lip (Hazerswoude, Netherlands) in 1991. Named after the wife of the finder. Mauve (H2) flowers, VIII–X; dark green foliage; spreading habit; height 21–25cm; spread 31–45cm. 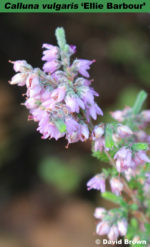 Introduced in USA before 1979; Alice Knight (Heather Acres Inc., Elma, Washington, USA) obtained this from The Rock Garden (later named Daystar; Litchfield, Maine, USA) in 1979. Mauve (H2) flowers, VIII–IX; green foliage with a greyish sheen; upright; height 31–45cm; spread 31–45cm. ❁ White flowers, VIII–X; mid-green foliage; height 21–25cm; spread 31–45cm. Very similar to 'Alba Plena', but the foliage is a little darker and the flower-spikes a little longer on unpruned plants. Sport "on a pink-flowered plant"; found by Mrs Frye about 1940 in her garden at Seattle, Washington, USA; originally propagated by Frances Robertson, nurseryman to Professor Frye, and reputedly introduced into Britain by F. J. Chapple. White flowers, VIII–IX; bright green foliage all the year; spreading habit; height 10–15cm; spread 26–30cm. Wild-collected (collector's no. K16); found on St Kilda by R. J. Brien (Pitcairngreen Heather Farm, Perthshire, Scotland) in 1966; introduced by R. J. Brien by 1968. Named after Jock Nimlin, gem collector and field officer on St Kilda, and alluding to the foliage colour. ♤ Flowers-buds white, 4mm long, 1.5mm across; IX-X; foliage dark green with mid-green new growth; habit upright; height 30cm; spread 25cm after 3 years (pruned). Grows without problems in hot summers. PBR granted on 20 January 2011. Deliberately raised seedling made in October 2007 by Helmut Hiedl; selected in October 2008. ® C.2014.03 : registered on 9 January 2014 by Helmut Hiedl, Altrusried-Krugzell, Germany. White flowers, VIII–IX; lime green foliage; bushy habit; height 26–30cm; spread 31–45cm. Named after the wife of the finder. 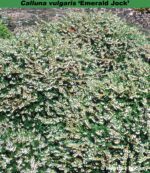 White flowers but few in number, VIII–IX; sage-green foliage composed of especially tiny leaves giving an unusual appearance; upright compact growth; height 26–30cm; spread 31–45cm. 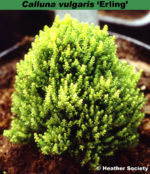 Extreme dwarf, dark green foliage; looks like a ball of moss. Sport (witch's broom) on 'Martha Hermann', in Sweden by a friend of Brita Johansson in 1990. Named after the finder's husband. White flowers, VIII–X; golden yellow foliage throughout the yea; upright; height 26–30cm; spread 26–30cm. ♤ Cerise (H6) buds, IX–XI; dark green foliage; upright; height 40cm; spread 40cm.